This is a wonderful migration story from Sammy’s (a young Wilson’s warbler) point of view. For some reason Sammy is late leaving to migrate and doesn’t know the route, so he stops along the way to ask some helpful animals who explain their own migration patterns and help Sammy find his way. Sammy meets a ptarmigan, caribou, sandhill cranes, a garter snake, green darner dragonflies, other warblers, monarch butterflies, a Hudsonian godwit, and humpback whales. 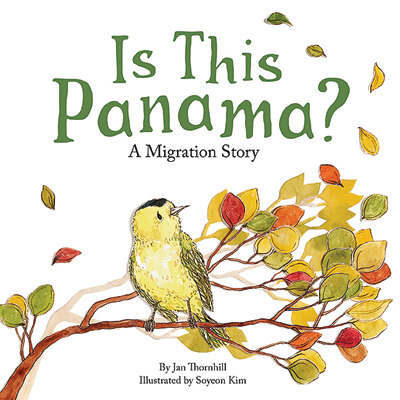 Full of interesting full-colour illustrations created by cutting and layering multiple images, this is a wonderful picture book introduction to migration. A short summary of migration facts and dangers finishes the book. Classroom Connections: Teachers can apply a variety of reading strategies while using this book as a read aloud, including making predictions (has Sammy found the right path? ), asking questions (why isn’t this new route right for Sammy? ), inferring (what do you think the snake eats? ), and transforming (how can we help birds like Sammy have safe migrations?). This book could be shelved in a classroom library, but really leads itself to discussion about migration, the variety of animals on the earth, and human impact on animal habitats, so is best read by adult and child. Editor’s Note: Winter’s Coming A Story of Seasonal Change by Jan Thornhill arrived too late to review for this issue, but it is another excellent exploration of animal adaptations.